This mild weather has us in the transitional outfit stage, that is neither winter nor summer, when outfits are tricky to plan, with rain, hail or shine all possibilities on the weather front. So clothes that bridge this gap are your friend, and none more so than a chino trouser, which is big news for ss2012. And GAP are selling all there chinos (or Khakis as they like to call then) for £25 at the moment - and if you sign up for their emails, you'll get another 15% off discount code. I've ordered the pink pair, tying in with the trend for pastels this season. 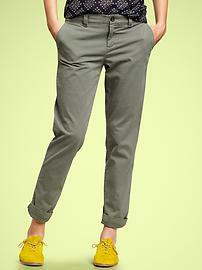 H&M and M&S are also doing some lovely chino styles - the high-street is doing this trend well. Wear them with brogues and a trenchcoat on a chilly day, or when the sun comes out with some ballet pumps and a blazer. 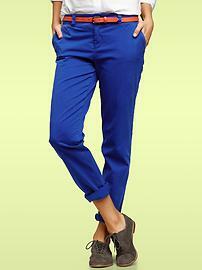 These trousers will even take you into evening, looking great with turn-ups and a pair of heels.